FLOCERT is a global certification and verification body, dedicated to strengthening the development of fair international trade. Our partners at Neo designed a great looking new site for them which offers easier navigation and a better experience for mobile phone users. We built the site using WordPress and we’ve ensured that all aspects of the site can be easily translated. Currently both English and Spanish versions of the website are available. 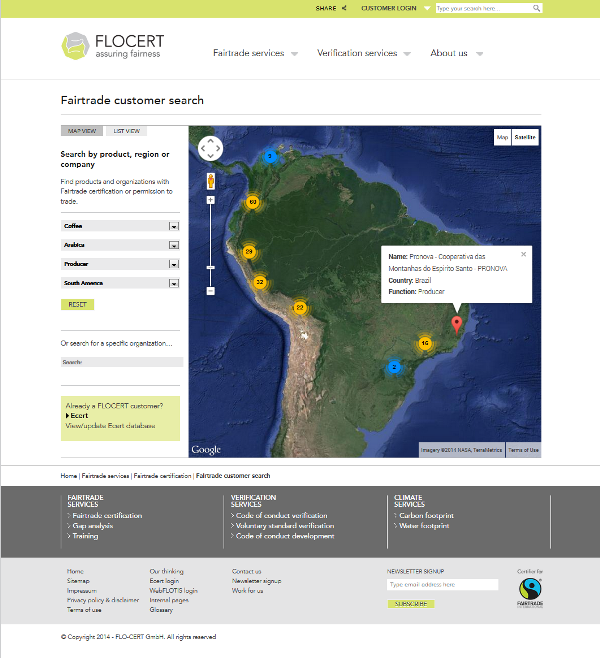 Another nice feature of the site is the Fairtrade customer search page, which displays all of FLOCERT’s Fairtrade certified products and organisations on a map or in a list view. This required close integration with FLOCERT’s existing Ecert database, to allow website visitors to search based on product, region and commercial function or to search for a specific operator. BrightMinded built us a multi-lingual site that looks great on all devices. We have been impressed with the service they provided and the support they are still giving us.